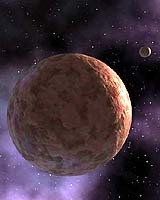 Artist conception of the planetoid Sedna. The Binary Research Institute (BRI) has found that orbital characteristics of the recently discovered planetoid, "Sedna", demonstrate the possibility that our sun might be part of a binary star system. A binary star system consists of two stars gravitationally bound orbiting a common center of mass. Once thought to be highly unusual, such systems are now considered to be common in the Milky Way galaxy. Walter Cruttenden at BRI, Professor Richard Muller at UC Berkeley, Dr. Daniel Whitmire of the University of Louisiana, amongst several others, have long speculated on the possibility that our sun might have an as yet undiscovered companion. Most of the evidence has been statistical rather than physical. The recent discovery of Sedna, a small planet like object first detected by Cal Tech astronomer Dr. Michael Brown, provides what could be indirect physical evidence of a solar companion. Matching the recent findings by Dr. Brown, showing that Sedna moves in a highly unusual elliptical orbit, Cruttenden has determined that Sedna moves in resonance with previously published orbital data for a hypothetical companion star. In the May 2006 issue of Discover, Dr. Brown stated: "Sedna shouldn't be there. There's no way to put Sedna where it is. It never comes close enough to be affected by the sun, but it never goes far enough away from the sun to be affected by other stars... Sedna is stuck, frozen in place; there's no way to move it, basically there's no way to put it there – unless it formed there. But it's in a very elliptical orbit like that. It simply can't be there. There's no possible way - except it is. So how, then?" "I'm thinking it was placed there in the earliest history of the solar system. I'm thinking it could have gotten there if there used to be stars a lot closer than they are now and those stars affected Sedna on the outer part of its orbit and then later on moved away. So I call Sedna a fossil record of the earliest solar system. Eventually, when other fossil records are found, Sedna will help tell us how the sun formed and the number of stars that were close to the sun when it formed." Walter Cruttenden agrees that Sedna's highly elliptical orbit is very unusual, but noted that the orbit period of 12,000 years is in neat resonance with the expected orbit periodicity of a companion star as outlined in several prior papers. Consequently, Cruttenden believes that Sedna's unusual orbit is something indicative of the current solar system configuration, not merely a historical record. "It is hard to imagine that Sedna would retain its highly elliptical orbit pattern since the beginning of the solar system billions of years ago. Because eccentricity would likely fade with time, it is logical to assume Sedna is telling us something about current, albeit unexpected solar system forces, most probably a companion star". Outside of a few popular articles, and Cruttenden's book "Lost Star of Myth and Time", which outlines historical references and the modern search for the elusive companion, the possibility of a binary partner star to our sun has been left to the halls of academia. But with Dr. Brown's recent discoveries of Sedna and Xena, (now confirmed to be larger than Pluto), and timing observations like Cruttenden's, the search for a companion star may be gaining momentum. Japanese astronomers report they have employed a combination of observing strategies and advanced imaging technologies to produce the most detailed picture yet of a dusty disk surrounding a nearby star. "Zero G and I Feel Fine"